In a context where all other forms of political action seemed to be blocked in the foreseeable future, municipal elections offer a unique opportunity to challenge the establishment. Town hall meeting held by Beirut Madinati, April, 2016. Author's photograph. ”Despair is not our fate”, “32,000 reasons to hope”, “40% for change” - hardly had an electoral defeat ever sparked as much hope as “Beirut Madinati”, Arabic for ‘Beirut is my city’, did. Despite its failure to gain any of the twenty four city council seats (given the majoritarian system), this less than a year old volunteer-led campaign of independent activists managed to win 40% of Beirut’s electorate in the recent municipal elections held on May 8, against a coalition of deeply entrenched, decades-old sectarian parties. The rise and success of Beirut Madinati lies in its innovative way of blurring the lines between institutional and street politics. Born from the ashes of the widespread summer 2015 “you stink” protests against a “rotten system” unable to resolve the garbage crisis; Beirut Madinati aimed to make voices, silenced on the streets, heard in the ballot boxes and take back the city council. In Lebanon, municipal elections are usually a somnolent affair, revolving around members of traditional political families allied to major sectarian parties. They are often devoid of meaningful opposition, the establishment’s pre-election negotiations largely determining the results prior to the election process itself. Voters' apathy and disaffection with politics, reflected in a low turnout (around 20% in Beirut in the last 2010 polls) are hence typical. This is amplified by the fact that Lebanese citizens vote for the municipality of their district of origin instead of the one of their current place of residency. This is particularly critical for Beirut, where less than half a million are allowed to vote in a capital of about 2 million inhabitants. Municipalities are the most local form of governance in Lebanon, with financial and administrative independence and a tremendous decision-making power. Yet, in a context where all other forms of political action seemed to be blocked in the foreseeable future, municipal elections offer a unique opportunity to challenge the establishment. They are in fact, the first polls of any kind in Lebanon since 2010, presidential and parliamentary elections having both been adjourned. The Parliament unconstitutionally extended its own term twice and the country has been without a president since May 2014, when the mandate of Michel Sleiman expired. Besides being one of the last remnants of a functioning democracy, municipal polls open one of the most effective roads to change. Municipalities are the most local form of governance in Lebanon, with financial and administrative independence and a tremendous decision-making power. Yet, and particularly in the case of Beirut, the delicate power-sharing arrangement among the various sects and political blocs within the city council, has impeded its autonomy. If the municipality electoral law does not entail per se an appointment distributed equally between Christians and Muslims and a fair distribution of the various sects, it has in practice conformed to the country’s consociational formula, making the city council very permeable to increasing tensions at the national level and paralyzing its work. To bypass this stagnant system and reactivate the city council, a group of activists resolved to leave their “comfort zone” and dip a toe in the realm of conventional politics. Their aim was to channel the energy and expertise of a vibrant civil society working in parallel to a dysfunctional system since the end of the civil war (1975-1990) and make its voice heard from within, in an attempt to “revamp” it. This effort marks a turning point in the wave of anti-sectarian mobilizations in post-war Lebanon; a predominantly youth-led grassroots movement operating outside the realm of conventional politics. These efforts have for long gone unnoticed, largely perceived as marginal and doomed to failure; until the unanticipated scope of the summer 2015 mobilizations brought them to light. These efforts have for long gone unnoticed, largely perceived as marginal and doomed to failure; until the unanticipated scope of the summer 2015 mobilizations brought them to light. Research investigating these new modes of politicization reveals how the anti-sectarian activists confront the system through a political praxis based on subjectivity, experience and prefigurative politics and underlines how the “subjectivity path” they take, simultaneously draws them closer and further away from achieving their democratic aspirations. This “alter-activist” mode of engagement allows them to resist a system interfering in the most intimate aspects of their daily lives and to overcome political deadlock by producing democracy in the “here and now”. Yet, the advantages of this mode of engagement simultaneously constitute its fragility. While the activists’ efforts to embody their transformative visions in their everyday practice is per se a transformative experience, their determination to ensure a means-end consistency and their commitment not to “get their hands dirty” remain among the many challenges to having an effective impact in the realm of conventional politics. Yet, mounting frustration over the ruling class inability to formulate an effective plan to resolve the garbage crisis and manage urban affairs, following last summer’s wave of mobilizations acted as a “wake up call”. “Protesting was not enough!” and “it was no longer possible to wait for an unresponsive ruling class”, unable to provide basic needs. Thus, in what the activists often describe as “the last chance”, they decided “to take matters in their own hands”, and venture into the realm of conventional politics. 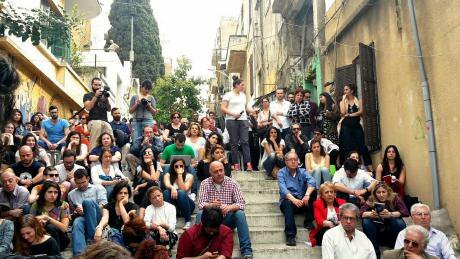 If Beirut Madinati’s activists embarked on a different road, they remained faithful to their roots; they engaged in electoral politics, while maintaining their “alter-activism” culture. This is very much reflected in the internal organization of the movement and its campaigning strategy. Beirut Madinati heavily relies on technology and social media, while not rejecting some “old-school” methods to reach potential voters. It developed a mobile app. and majored on phone calls; targeted Facebook walls and knocked on doors, tweeted and held press conferences. Moreover, while preserving its “spontaneous soul”, the campaign sought to work on its image and “branding”, from developing a logo and customizing campaign material (bracelets, pins, t-shirts, etc. ); to keeping a “positive”, “pro-active” discourse beyond the confrontational and denunciatory tone typical of protest. Likewise, if it largely remains a volunteer-led campaign, a small part-time administration team was hired to assist the more than 1000 volunteers on the ground. In addition it relied on crowd funding and accepted donations, though only from individuals. And, in its effort to guarantee transparency and practice the values it endorses, a ceiling was put to donations (less than 10% of its budget) and its financial statements were published online. Working for and with the people to reclaim the city, was Beirut Madinati's main objective. With a horizontal and a leaderless structure, this volunteer-led campaign sought to make the decision-making process as inclusive and transparent as possible. With a horizontal and a leaderless structure, this volunteer-led campaign sought to make the decision-making process as inclusive and transparent as possible. Through a participatory and a community-based approach it sought to reconnect Lebanese citizens with the political sphere. Since its start, it has actively engaged the Beiruti inhabitants in the decision-making process. Its ten-point policy programme drew on community-based research. It brought together the technical expertise of specialists in various fields (including urban planning, transportation, waste management, etc.) and people’s everyday knowledge, concerns and demands. Likewise, Beirut Madinati organized Monday open houses, Wednesday breakfasts, Saturday gatherings in public squares and a series of events to reach the “ordinary” citizen. Its aim was twofold, spread the word about the campaign and foster dialogue, inform people about their programme and learn from them. By creating these spaces for dialogue, both “online” and ‘offline”, the campaign aimed to “embrace the diversity of the city”. It strived to listen to a plurality of voices across age groups, and socio-economic backgrounds, beyond the traditional activists’ circles, in an attempt to address their concerns and take in their suggestions. Beirut Madinati thus challenged the traditionally “personality-based” campaign. It put forward its platform and did not announce its list of candidates until a few weeks after the campaign was launched. This determination was exemplified by the lack of any poster for the candidates, usually flooding the streets. Yet, if the movement introduced new ways in the typical Lebanese electoral scene, it did not entirely disengage from some “traditional” considerations, but juggled between the two, downplaying the latter. This was particularly evident in the very selection of the candidates. Expertise and experience were the main selection criteria. Most of the candidates had actively worked on civil campaigns and projects for the preservation of the city heritage and public spaces; and succeeded in their endeavor. The best “success story” is probably that of the “Barakat building” (also known as “Beit Beirut”, literally the Beirut house), a historical landmark saved from demolition and converted into the capital’s first museum of war, memory and history, largely through the initiative and tireless efforts of Mona El Hallak an architect, also running with Beirut Madinati. Yet, if it strived to remain a leaderless movement organized around qualified “ordinary” citizens the list of candidates also included a few public figures such as a renowned singer and filmmaker. Since its start, it has actively engaged the Beiruti inhabitants in the decision-making process. Likewise, equal representation was a central consideration. Gender parity was for the first time ensured, in a country where women remain largely under-represented in government posts (three out of twenty four in the former city council). Moreover, in its effort to present a list as inclusive and representative as possible of the capital’s social fabric, the candidates were selected from a diversity of professional and socio-economics backgrounds. A fisherman, a school director, a painter and installation artist, a journalist, and a longtime activist in advocating for the rights of persons with special needs, were among the different profiles, besides architects and urban planners. Religious diversity was also taken into consideration. In this regard, Beirut Madinati aimed at a balance between some “traditional” considerations and its core values. It did not challenge Muslim-Christian parity and maintained an equal representation of the different sects; yet, religious diversity remained a secondary consideration for a campaign precisely born from a need to free politics and the provision of public servcies from the grip of the sectarian powers. This attempt to remain as inclusive as possible and “play the electoral game” without compromising on its principles, was also visible in the campaign’s diplomatic relations with the sectarian parties. If it did not reject an invitation from any party, it did not initiate any meeting and entirely withheld itself from sectarian and political alignments. “May 8 was a turning point and we will continue to work together for our city and our country”. “May 8 was a turning point and we will continue to work together for our city and our country”. With this statement Beirut Madinati ended its last press conference following the official announcement of the results. If the pressing question revolves around the next steps to harness this momentum; for now one can confidently assert that Beirut Madinati paved the way for a new kind of politics beyond sectarian lines and clientelistic networks. While the establishment candidates retained control of the city council, with 40% of the votes Beirut Madinati’ score was massive. It captured the Lebanese’s increased resentment and waning faith in the governing parties and proved that transcending traditional party politics is possible. It asserted that electoral politics can no longer be reduced to sectarian loyalties and alliances, that socio-economic concerns need to be addressed and that gender parity very much resonates in a country were women still lack some of their basic rights. Yet its political victory lies far beyond the election score itself. Its citizen-centric, community-based, approach opened spaces of dialogues and reconnected citizens with politics. Likewise, its issue driven platform challenged the traditionally “personality-based” campaign and revamped electoral practices. The rise of Beirut Madinati has in fact pressured the competing coalition of sectarian parties, to present a platform for the first time, and adopt a discourse addressing citizen’s everyday concerns. If the victory remains incomplete, its effort inspired hope and gave an impetus to the burgeoning of similar initiatives in other Lebanese towns. Since its start, it succeeded in disrupting the Lebanese electoral scene, challenging the old-ways and imposing more democratic rules to the election game. “Beirut Madinati taught us the city itself […] its stories and alleyways”, the words of this young volunteer very much captures the campaign’s effort to recommend policies that are reflective of and responsive to people’s needs. Consulting with the people was not a mere strategy to convince potential voters. “Think with us!” one could read on their Facebook page, two weeks after the Election Day, as they invited citizens to share their feedback and suggestion for the next steps to undertake.